1- Group: today you need to translate those important business texts into English, but when your company needs to translate them into French, German or Italian, Okodia will also help you. How? We are your outsourced translation team, your professional partner who will always deal with your translations, whatever the final translation language you need. With Okodia – Translation Group you have a tailored global service that listens to your needs and provides specific solutions. 2- Translation: in an increasingly interconnected and globalised company, translating your company’s corporate texts into other languages is a must. Having them well translated is also an obligation. After all, it’s your image. Internationalising means contacting global markets, translating means expanding the business, translating well means increasing your profit. Okodia is your partner specialising in translation services. We are experts in various disciplines, and our team (your team) of native translators and linguists will provide their linguistic knowledge and experience to optimise the message you will send to your market: if your texts are professional, your translations should also be so. “We have been working with the Okodia Group for two years now in the translations of all our clients’ development projects, and I only have words of thanks for them. During all this time, they have been able to adapt to every client and business, meeting every deadline and providing excellent results. We would like to make use of this opportunity to thank them for their service, always so fast and helpful. Thanks, Okodia! Transparency, trust, agility, experience, flexibility, cooperation, and professionalism: these seven adjectives perfectly sum up the essence of Okodia – Translation Group. Transparency: the key to clear work. You know what our prices, deadlines and conditions are from the start. You’ll find no “small print” at Okodia. Trust: we are your strategic partner and as such we benefit from your achievements. We trust in your project in the same way that you trust in our professional know-how. Your benefits are also ours. Agility: time is money, both yours and mine. Your translations will be completed on schedule, when you need them. Experience: the know-how of our translation team at the service of your project. Years of experience to improve the productivity and profitability of your translations. Flexibility: you need personalised solutions that adapt almost on a daily basis to new challenges and needs; changes that require flexibility in terms of time, requirements and conditions. Cooperation: we are a specialised partner, a group of people that join your own work team to achieve a common goal: success. Professionalism: we offer a guarantee of success. Try our professional services now and decide for yourself. By partnering with Okodia – Translation Group, your products and services will reach your global market. Your new clients will read in their own language, trust you and you will increase your profits. Be ahead of the pack! It seems simple, but it really isn’t. Trust your new professional translation partner. 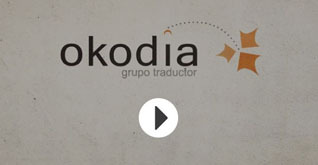 You can rely on Okodia – Translation Group.